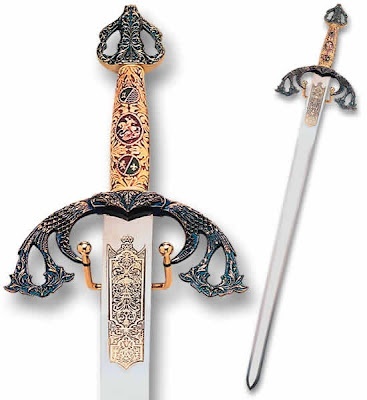 Forum Index > Historical Arms Talk > Identify this sword. Posted: Tue 09 Aug, 2016 5:14 pm Post subject: Identify this sword. I have recently acquired a sword and I have no clue what it is other then what I have been told. The information I've been told is that it's a display. And it is something called a rapier. I know nothing else. Please help me identify what it is and possibly where it is from. I know it is most likely not real however I would like more information about it. Thank you in advance. Welcome to the boards! It looks like you've been bitten by the "weapon bug". I hope this is the beginning of an enjoyable hobby (adventure?) for you. And hopefully we can be of service in your quest. It looks like a decorative (all swords are decorative, but in this sense it means "do not swing it around or chop or stab anything with it, otherwise it could break off and hurt someone. Most possibly yourself.") representation of the Colada Del Cid. From the pics, it looks like the guard and pommel are cast pot-metal with gold tone. There is no actual detail in all of the bumps and swirls. The original and many of the better replicas show details of figures (cherubs, angels, faces, and human figures?). The grip looks possibly to be plastic. The flatness symmetry of the blade speak to the fact that it is a wall-hanger and not to be handled aggressively. It's not a horrible tourist piece. But as you guessed it's not "real". But luckily for you, it's also not false (in a, "it's just a hologram!" or "it's made of spun sugar!" sense of the word) It's not valuable. I wouldn't bother getting it insured. I found a pic of a Tizona el Cid with the same grip. Most likely the same manufacturer, but no clue what made it. There are a lot of variations on it, but I'm pretty sure yours is also a Colada. 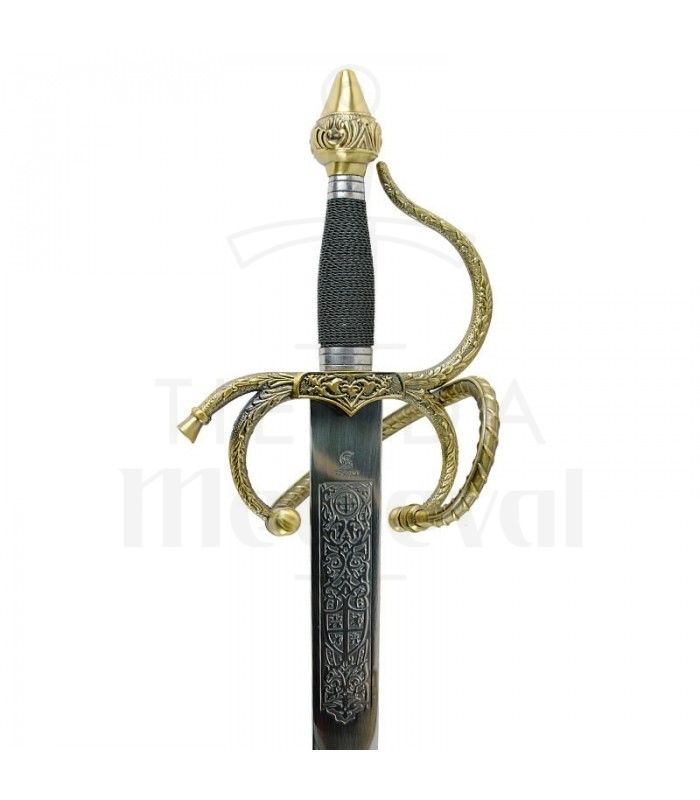 And when I google "Colada El Cid" I get about a thousand pictures of similar Toledo manufactured swords (though not identical to yours). My guess is that yours is an older offering by the same manufacturer of this sword. They've just changed the grip. I use two things for sword hanging. One is curtain hooks. I bend out the pin portion at about 60 or so degrees and drill a slightly smaller pilot hole. This works great on drywall. The other is the steel picture hangers. I use two of each for a sword. The great thing about these is they tend to 'disappear' against the background of the blade or hilt. Your sword is going to present a bit of a challenge with the basket because the blade is always going to be at an angle to the wall. If you want to hang it, I would suggest taking advantage of that angle and hanging it above eye level so that the engraving is easy to see for guests to your home. there are several display threads on the forum as well that will have many different ideas.